The cover and table of contents for Issue #33 are shown below. 1) "Chasing the T206 Hal Chase 'Holding Trophy' Pose" by Tom Shieber. 2) "1895 N566 'Newsboy' Cabinets Highlight Fourteen NY Players" by Bruce Babcock. 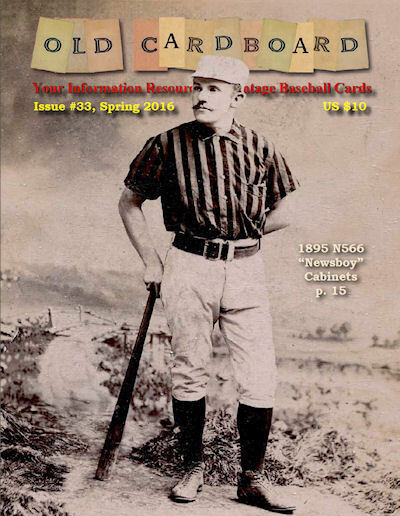 3) "1903 World Series: First of the Modern Era" by Old Cardboard Staff. 4) "The 1929 R316 Kashin Pubs Set and Its Still Mysterious Origins" by Eric A. Schmidtke. 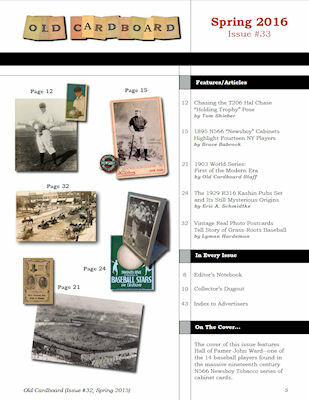 5) "Vintage Real Photo Postcards Tell Story of Grass-Roots Baseball" by Lyman Hardeman.